Posted 3 years ago on Tuesday, April 5th, 2016 by James S.
The previous owner of my house put on an addition. During that job, somebody relocated a duct on the AC venting. While there’s nothing wrong with that, what IS wrong is that they simply put foil tape over a gaping 8-10″ hole in the ductwork and called it a day. 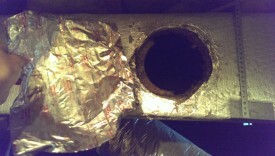 Of course, the foil tape started getting damp and pulling off in short order, causing a leak. 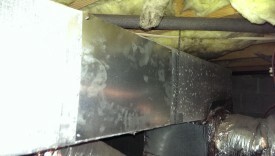 Air duct leak repair was in order. I was wondering why my shop is so cool in the summer, and I realized it’s because thanks to this, my AC was cooling my uninsulated crawlspace – and the rest of the world, too. I decided to go back and do a cheap quick repair to the duct to seal it up again. Ideally, you will do this job when the weather is nice enough to shut off your AC. 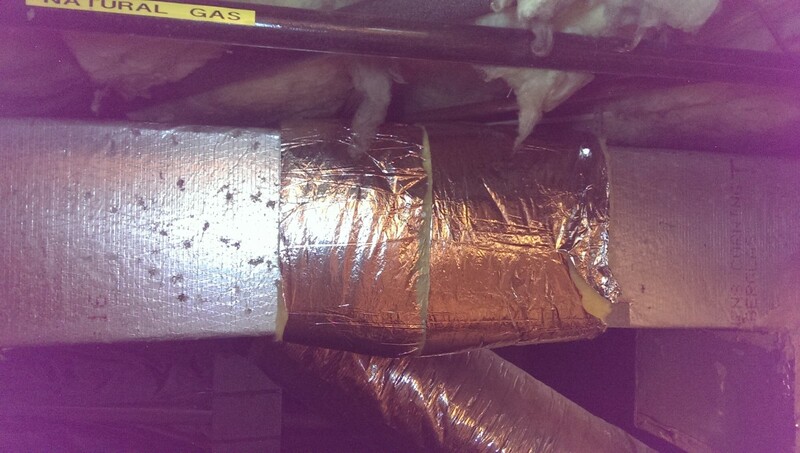 You don’t want the AC blowing and causing condensation and other issues during the process, especially for applying duct mastic and insulation. The first step is to seal that hole up, so that air is no longer escaping. 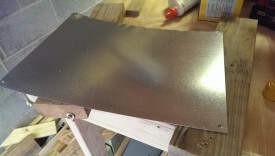 I grabbed a galvanized duct sheet from the local home depot, along with some duct mastic. I already had some aviation snips to cut the sheet with. I then removed the mass of foil tape that was sitting on top of the hole to get a clean surface to work with. 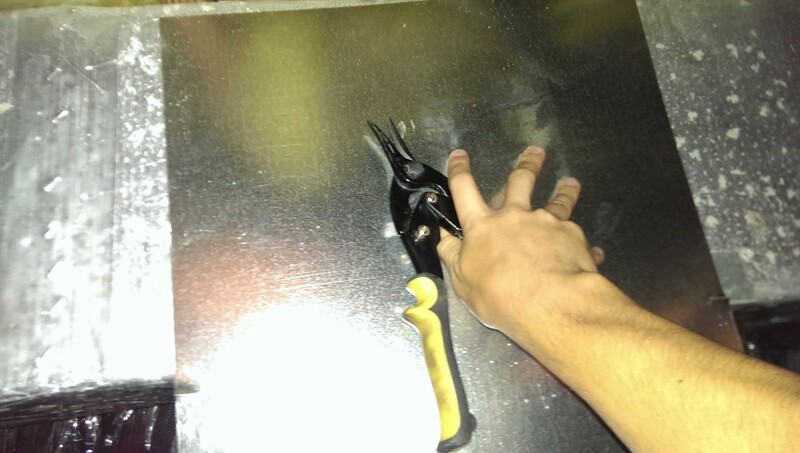 Then, the tin snips can be used to cut the sheet down to cover the hole and fit to the duct. 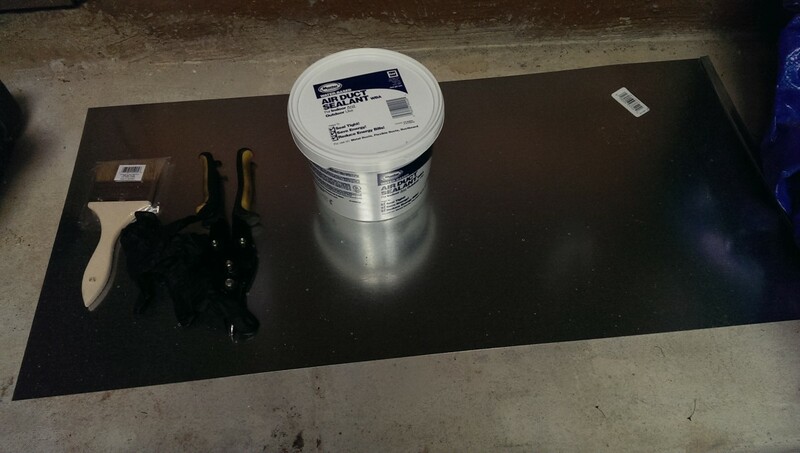 I predrilled some screw holes in the sheet to make it easier to install them in the next step. The machine screws I used weren’t particularly sharp. 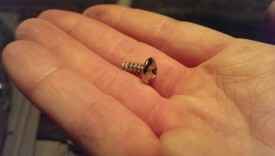 I used some extra machine screws I had laying around to do this part. It seemed to me that the duct mastic will hold the sheet on permanently, so I figured these screws were only really there to hold it while the mastic was dried. 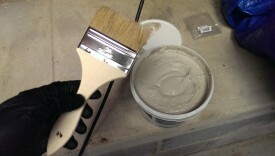 I had a brush to use with the mastic, but I ended up using my hands, while wearing disposable gloves, to just smear it on. The result isn’t going to win awards for looks, but it is sealed up tight. Additionally, once dried, the mastic is really there for good. It won’t get damp and start peeling up like the foil tape did. Obviously, you should let the mastic dry before proceeding to the next step. I would just leave it overnight. I actually left it as pictured above for awhile until I had a chance to get back to this. 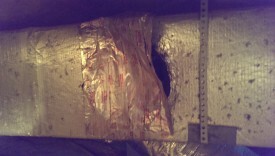 The sheet and mastic seal the hole from airflow, which helps a great deal. 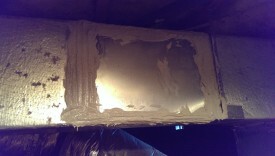 However, they don’t insulate it, so the sheet will get condensation on the outside and you’ll get some cooling losses. I went to the home store and got a small roll of insulation and extra HVAC foil tape. 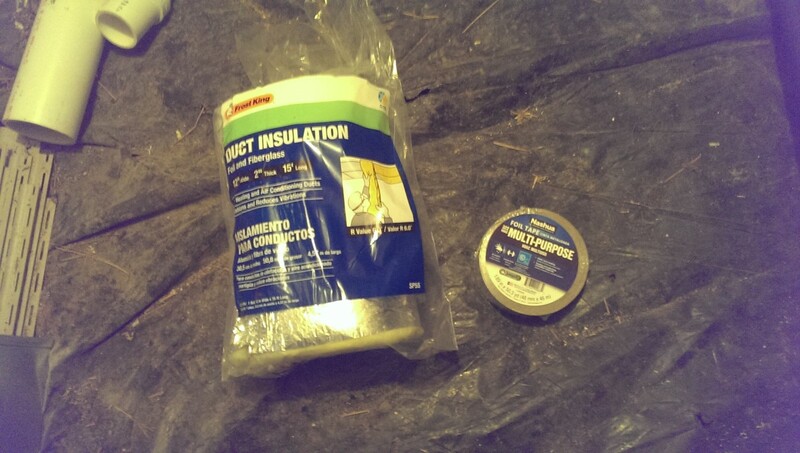 The insulation is just generic foil-backed fiberglass; the R-value is probably not that high, but it’s better than no insulation. Note: Fiberglass fibers are very bad for you to breath in, and they aren’t great for your skin either! Wear an approved mask or respirator, gloves, and cover exposed skin. One more time: wear gloves and a mask while doing this part of the job. 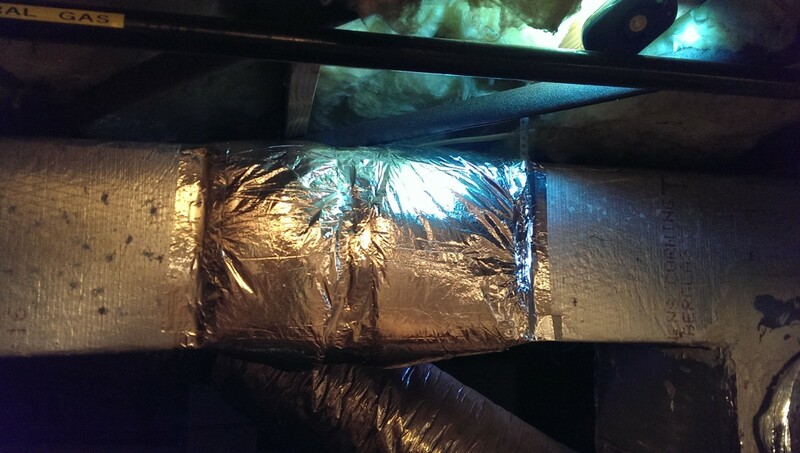 I simply wrapped the insulation all the way around the ducting a couple of times. The instructions say to overlay it about 1″. I did quite a bit more than that, since I was covering such a small area. I could have tried to tape it on just the sheet, but I figured this would hold better and be more effective. Finally, I wrapped all the exposed seams in foil tape, to tape them down to the duct. It’s worth wiping the duct off with a damp cloth or something first to get good adhesion. I also accidentally poked a hole or two in the insulation’s foil – when that happened, I covered it up with more foil tape. So far, this has lowered our power bill and increased the effectiveness of our AC fairly substantially.